State police and National Guard will deploy 1,000 uniformed officers across the New York City area following the explosion in the Chelsea neighborhood of Manhattan Saturday night, Gov. Andrew Cuomo announced Sunday. Those agencies, as well as the Division of Homeland Security and Emergency Services, the Metropolitan Transportation Authority and the Port Authority of New York and New Jersey, will remain on a heightened state of alert. 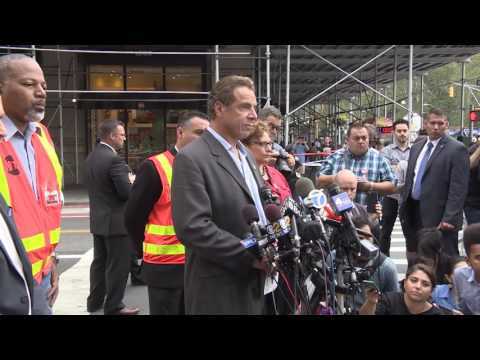 Cuomo, who visited the site of the explosion and delivered an update on the scene to reporters, said he directed the deployment out of an abundance of caution to high-profile locations. "Whoever did this, we will find and they will be brought to justice," Cuomo said. "Life will go on in New York City as a normal Monday workday. We're not going to let them win." Cuomo also announced that after a rigorous inspection, MTA and PATH train service has been restored and both systems suffered no structural damage. All trains running on the E, F lines will continue to bypass 23rd street station and trains running on the No. 1 line will not stop at 23rd or 28th street stations.